Here are picks for week three in the NFL. I have made picks for the Thursday, Sunday, and Monday night games. Since this is a west coast blog, I have made my picks for the NFC Western Division games. Then I threw in one game that I thought interesting. So here we go. In last night’s matchup between the Giants and the Redskins, I had the Giants who beat Washington 32-21. I have to admit that I reluctantly pick the Giants. I was not sure they would be able to over power Washington’s defense that looked really impressive in their game against the Rams. But, I picked the Giants anyway because I had to admit that the Rams’ offensive line made Washington look good, and I walked away with a win. The Sunday and Monday night games were pretty easy to pick for me. In the Sunday Night game, I took the Broncos over the Lions, and in Monday Night game, I went with the Packers over the Chiefs. Even though I like the Rams, I went with the Steelers’ defense to handle the Rams’ struggling offensive line. I am not that optimistic that Gurley’s will have much of impact in this game for the Rams, as much highly prophesied. Do not forget that he has not played in a NFL game, so far this season, so we do not know what to expect from him. Also for me, the jury is still out in Nick Foles. So at the end of this game, I expect the Rams to have another loss. This will be the NFC West’s first interdivision game. It pits the Cardinals against the 49ers. I like Carson Palmer much better than Colin Kaepernick in this game, so I am going with the Cardinals. In this next game, unfortunately I have to go with the Seahawks to get their first win over the Bears who have their problems. Also, a Seahawks’ loss could mean there could be a new western division leader this year. This game is a rather interesting game because it has the Jets(2-0) up against the Eagles(0-2). So far, the Jets have surprised me. Who would have thought that they would win their their first two games . But, the Eagle have me perplex. I anticipated a much more solid performance in their first two games. I expected flawless play from Sam Bradford, but his performance has left me rather disappointed. He has thrown four interceptions, so far. So, who did I choose? I picked the Eagles for two reasons. First, I trust Kelly will make the adjustments needed to produce the Eagles first win. Second, I do believe that the Jets will produce a third win. I believe the Jets are good, but not better than the Eagles. This is my picks for week three. Some of the picks were straightforward while others were made grudgingly. I do hope I am wrong about the Seahawks because being a Rams fan, I would like to see them dethrone as NFC West Champions. While, I hope that I am surprised by a Rams win. I guess I’ll have to wait for Sunday evening to find out. Should The Rams’ Fans Start Panicking After Yesterday’s Loss To Washington? As the game clock tick its final moments away while Kousins and Washington celebrated their victory over the Rams, those knee jerk reactions took over my emotions. Even though this was one loss, I felt something drastic had to be done to save the season, but which knee jerk reaction would turn this Rams team away from another season of self destruction? My first knee jerk reaction was to pull QB Nick Foles from the starting position. It did not matter that he had completed half of the passes that he had thrown or that he had thrown a TD, yet I wanted him replaced with Keenan. The kicker here is that all I know about Keenan is that he had a good preseason against second team players. I never saw him play against starting players, so how do I know how well he would play? For all I know, he’d probably throw not one interception, but two. All that did not stop me from wanting Fisher to do the unrealistic and put Keenan in the game just do something. Just do to something. Do you know how that sounds or better yet, vague? But, it did not stop me from wanting Foles replaced with Keenan, and it did end there. I wanted Frank Cignetti and Gregg Williams fired for I thought was terrible play calling. Like I would know what terrible play calling even looks like, yet just to do something, I wanted both fired. Though, I must confess that I have my doubts about Williams’ defensive coaching abilities. I just can’t wash, “Bountygate” and his suspension for it from my mind, but that is for another post. You ever notice how after good night sleep, all your problems or thought were problems disappear or look different? This is when your are glad that you did not embarrass yourself on social media by posting your knee jerk reactions. Well for me this is one of those times that I am glad to have kept my knee jerk reactions to myself. So to answer the question, should we panic? My answer would be no for now. and for two reasons. This first answer would be the young offensive line which did not help Cignetti do what he wanted to do by not blocking, plain and simple. For the second reason, what would you expect would happen when you have the Rams’ 23rd ranked running defense going up against Washington’s run heavy offense? It would collapse and for Williams, I will not let him off that easy. Its his job to make sure it does not collapse. 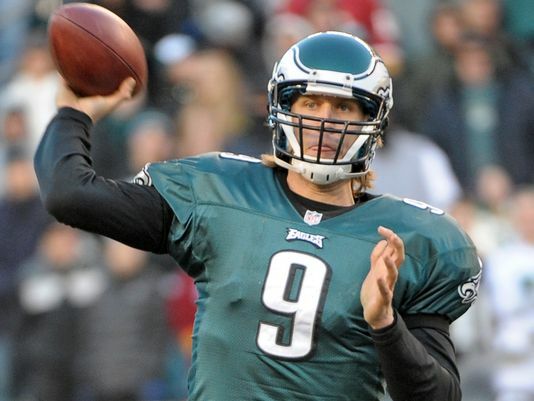 Will Nick Foles Go Down The Path Of Other Former Eagle Quarterbacks? While writing the post that asked the who would have a better year, Sam Bradford or Nick Foles, I started to wonder if Foles would go down the road as Kolb, McNabb, and Vick. So I decided to revisted these former Eagles quarterback to see where they are now. 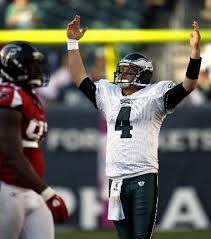 I want to start with Kevin Kolb who would replace McNabb as the starting quarterback in 2010. Kolbe was drafted by the Eagles in 2007 in the second round. He rushed three times in a regular season game Detroit that year. In 2009, he started two games when starter Donovan McNabb went down. His starting role would last one year before be traded to the Arizona Cardinals. He remained with the Cardinals for two years before being release in early 2013. He signed with the Buffalo Bills, but he ended up on injure reserve after suffering a concussion during a preseason game against Washington. During the off season of 2014 he retired after being released by the Bills. Post-Concussion symptoms was the reason for his retirement. Next up we have Donovan McNabb. McNabb was drafted in the first round by the Eagles. Under McNabb, the Eagles won the NFC east four times, five NFC championships, and loss their only Super Bowl appearance 2005. In 2010, he would be traded to Washington after 11 seasons as an Eagle. 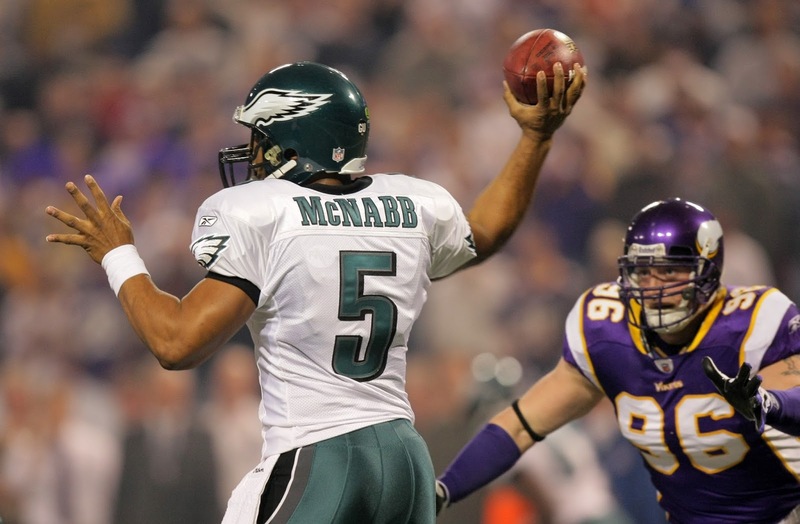 McNabb would then be traded in July of 2011 to the Vikings only to granted a release in December 2011. He officially retired as an Eagle in July 2013. 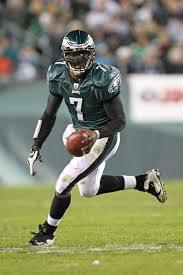 Last we have the controversial Michael Vick. Vick was the first pick of the 2001 draft by the Falcons. He would remain with the Falcons until 2007 when was released after pleading guilty for his involvement in dog fighting. After 21 months in prison, he would be reinstated in the NFL with the Eagles in 2009. In 2013, he would sign with the Jets, and in 2015 he signed with the Steelers. As of this writer he is still a Steeler. So out of the three former Eagles quarterbacks only Michael Vick is still playing, but has changed teams twice since leaving the Eagles. The other two have retired. All three quarterbacks have played together in 2009, and Andy Reid coached all three. With a track record of one out three former quarterbacks still playing in the NFL, which path do you think former Eagles’ quarterback follow? The Rams quarterback is Foles to lose. Just because he is a former Eagle that does not mean he won’t remain a Ram as long as he choses. Will Nick Foles Or Sam Bradford Have The Better Year? Maybe now is not the time to ask this question, but I want to ask it anyway. Who do you think will have the better year, Nick Foles or Sam Bradford? Foles on the other has achieved a rating of 95.4 after starting in three games. He has completed 16 of 23 passes. He threw one TD and one INT with three sacks. (NFL.com) Out of his three starts, his last one against the Colts was his best. Even though Bradford looks like he could have the better season right now, this could change for Bradford during the regular season by either poor performance or injury. Keep in mind that he has been prone to injuries in the past. Yet on the other hand he could have good year because he is finally in the Spread Offense. He played in this offense at Oklahoma. I pondered what kind of argument could you make for Foles, but I cannot honestly make one. Given the fact that it would not be fair to put these two quarterbacks to a head to head comparison even during the season. For the obvious reason that they play in two different offensive systems with two different demands placed on each. Now if you asked which quarterback has the most responsibility placed on him then I would have to say Bradford because he will be required to pass the ball more than Foles who will be handing the ball off more. With that being said, I would have to say that Bradford has the potential for a breakout because he has a better offense around him as compared to Foles’ Rams’ offense. Their offense line is still questionable. A starting has not been decided upon, and the heart of the running game, Mason and Gurley are questionable for the start of the season.